Why using Quodl has proven scientifically successful and what makes us excited about it. Quodl is a tool (‘app’) developed for institutions of higher education to improve student experience and retention. This is done through active student engagement using cognitive psychology of learning. It is developed by an academic working in behavioural science, so is grounded in his research on learning and memory, combining retrieval practice and spacing to help students learn. It is unique in being designed exclusively for use in higher education (HE), by taking into account the expectations and preferences of HE students and the time constraints of lecturers. 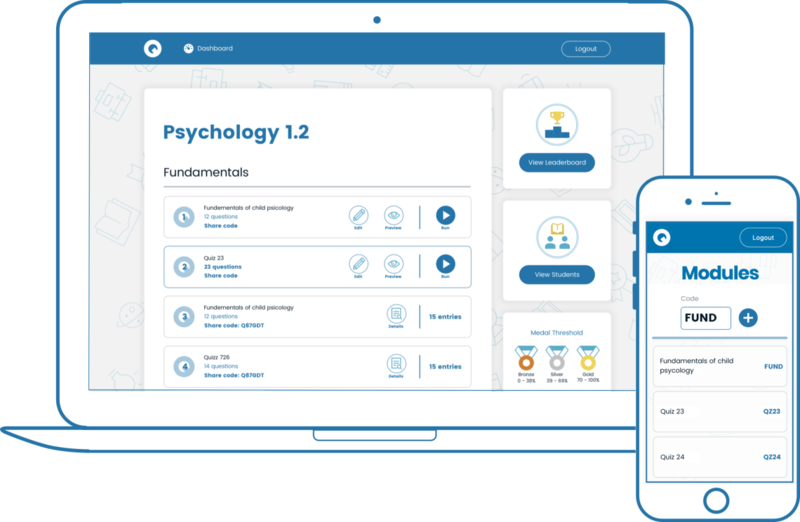 It offers students tailored written feedback, identifying areas in which they are performing well relative to the group, and areas in which they could improve; gamification keeps students inspired and motivated to participate. Implemented across the courses related to a student, it helps to identify those students that might need extra academic support and gives the opportunity for a timely intervention . Fun and engaging for students to use, improving experience of lectures. Early tailored feedback for new students on their performance relative to their peers. Lecturers: Identify areas that might benefit from revision. No additional workload for academic staff trying to enhance their lectures.